Dinosaur Comics - June 15th, 2007 - awesome fun times! 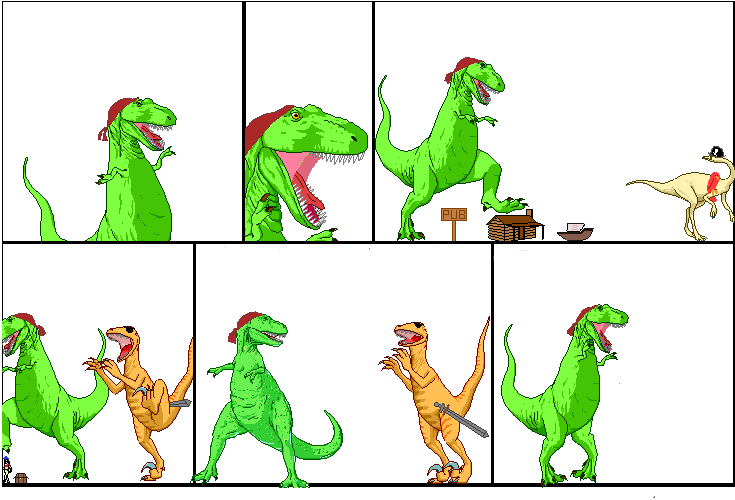 –I was unaware that I was T-Rex! June 15th, 2007: In the news today: scientists are working on making a perfect sphere kilogram, which they will then use to fix its definition in terms of atom count, rather than a physical object. You can read more here! I find this fascinating, although it does mean that eventually it will make it more difficult IF NOT IMPOSSIBLE to pull off the greatest heist! Also check out this new raptor discovered, called "Gigantoraptor". It is huge! It is approaching the entirely accurate scales in my comic, and once scientists concede that dinosaurs did in fact walk upright like people and talk about stuff like kilograms then I can get my award for "Best Historical Comic That Is True (Featuring: Dinosaurs)", a title which, coincidentally, was one of the top finalists for what would eventually be named "Dinosaur Comics". FINALLY, Angela Guardiani is a Masters Student who is doing some research on COMICS and if you wanted to help out a very nice lady who even baked me cookies even though I should have been the one to bake her cookies, you can fill out this simple 12 question questionnaire and email to her at we.read.comics@gmail.com. It's pretty quick and you get to recommend the comics that you like! One year ago today: if you think choosing a job based on its sexual attractiveness is a good idea, then have i got a comic for you!